Why choose Kore Communications to upgrade or install your new Digital TV antenna? Kore Communications will install your new Digital Television Antenna professionally and correctly the first time. We do not provide quotes over the phone – we come to your home and quote onsite. An onsite survey is the only way to truly ascertain the direction, signal strength and quality of Digital TV available to your home. This is part of our Free Quote offer for residential customers. Commercial properties may incur a small service fee which will be included in the final cost when you accept our quote. 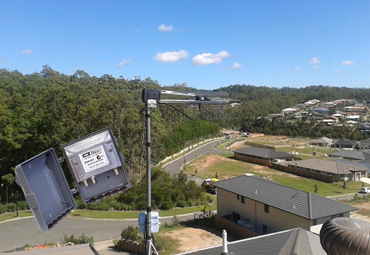 The switch to Digital TV broadcasting has eliminated annoying picture distortion, snow and ghosting, all of which made it so difficult to achieve a good analogue signal throughout Brisbane and its outer suburbs. By contrast Digital TV signals (both standard and high definition), will deliver crisp, clean, ghost-free pictures. Even if you have an old free-to-air antenna installed, there are several good reasons to consider replacing your old antenna with a new Digital Antenna. Digital TV is now available to almost all Australians. While the widest selection of Digital TV channels are found within metropolitan areas, coverage extends to most regional households which can access at least one local digital station while 89% can receive five or more stations. You can find which stations provide digital content within your local area by visiting the My Switch Website. Free-to-air Digital reception provides the best picture quality. Cable and satellite providers offer a wider range of channels, but to do this they use data compression or other techniques that compromise picture quality, resulting in a "soft" image, distracting video artifacts (pixelation), or both. Free-to-air antenna reception is the best way to enjoy HDTV programs at the full resolution as intended. Free-to-air signals are free. – apart from the cost to purchase a digital television and install of your new digital antenna, receiving Free-to-air HDTV is free. Access all of your favourite local channels – cable and satellite providers do not always carry the local channels in your area, or may not offer them in high definition. Also, contract agreements between local cable operators and local broadcasters can mean that high definition is only available as a paid add-on.Why pay an additional fee for something that is transmitted free in the first place? Perfect for amplification and distribution of Digital Television signals to overcome multi-outlet antenna system losses. (Amplification should only be used where required. Over driven signal may result in customer equipment failures and induce unwanted noise into antenna system). Most commonly used for residential applications these amplifiers will be found mounted just below the antenna. They are normally remotely powered by a power injector located internally conected directly into a outlet plate by "T" shaped injector. Whilst very popular with some installers, we only recommend masthead amplifiers in situations where the signal levels are very weak but in good condition thus overcoming multi-outlet losses. Overpowering an Amplifier will add unwanted noise to your system and will certainly reduce the quality of your signal (MER), which increases the risk of pixelation. Any cable losses between the antenna and the masthead amplifier will add noise to your system, cabling should be as short as possible, with the amplifier installed as close as possible to the antenna, without it being so close that it affects the antenna performance. This is usually within 300 – 500mm of the antenna. Produced by most manufactures internal amplifiers are normally found located behind tv sets. These very basic amplifiers should only be used where signal levels at the outlet plate have good MER readings but low signal strength. Once again if the amplifier is overloaded, it will certainly reduce the quality of your signal (MER), which increases the risk of pixelation. Multi storey buildings that want to be classified as "Foxtel Ready" needto have a Foxtel Approved 5 Wire Cabling System installed. This requires the installation of Foxtel specified hardware, an RG11 5 Wire Backbone, Dual RG6 Quadshield Cabling for each outlet, and specific signal strength and quality measurements at each outlet. Post installation, a system design and record of signal measurements is submitted to Foxtel for formal approval to register the building as Foxtel IQ Ready.